It's never too late to make a quick Spring Training trip. Well, as long as it's still Spring Training. If it's July and you've got a hankering I can't help you. But if you're watching pitchers and catchers report and you've got the jones, there's still time. Because there are so many games in the Phoenix area every day for about six weeks, sellouts are rare. 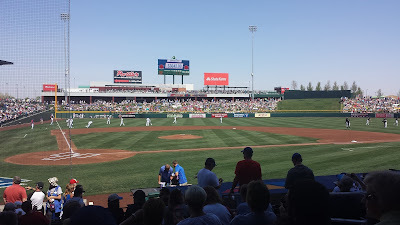 If you wanted to you could fly to Arizona on a Friday and go to a night game, go to a day game and a night game on Saturday, go to a day game Sunday- different parks each time- and be home in time to go to work Monday morning without anyone being the wiser. Unless you're sunburnt and hung over. Again, can't help you there. The point is if you want to go, you can go! It's not like some sort of exclusive club. If you can get there, you can make a spring training pilgrimage. However, the idea of spring training as you would like it to be is long over. The last time you could wander around camp without any trouble and chat with Duke Snider or Ernie Banks was- well, the days of Duke Snider and Ernie Banks. Spring training is a hot destination and the clubs know it. Tickets now cost as much or more than a regular game. Beer is definitely 12 bucks a pull. Hot dogs are $8.75 and souvenir hats are at least $30. So, in reality, if you have any sort of access to a minor league game already you can get pretty much the same experience if you're okay with not seeing players you recognize. In addition, you don't have to drop at least a grand on airfare and hotels and rental cars and drive around unfamiliar cities and do your best to avoid going to Buffalo Wild Wings because my god there's one so close at home and I can't be the only one who remembers their service is atrocious and how can you forget the time they charged us extra for changing the sauce on the wing special even though the option was right on the menu and it didn't say a damn thing about charging extra because it's on the damn menu and can we try avoiding chain restaurants on vacation for once in our damn lives? Besides all that there's a tremendously awesome quote that is particularly applicable to this situation which is, after all that hassle, we are still talking about practice, and not a game. Still, it's generally awesome and if you are any sort of baseball fan you need to go at least once. But you can't go just once, it's like the Pringles slogan (and not Pringles themselves, because I find it quite easy to eat just one. Or none at all, for that matter). 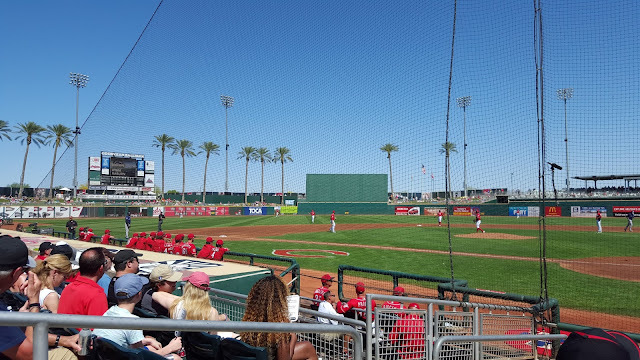 Since I've never done Florida Spring Training I can't specifically help you on your trip to Clearwater or Tampa, but some of the general rules to successful spring training are true whether you're headed to Glendale or Dunedin, like the first one. Nothing ruins a vacation more than being in the car 5 hours a day. While all Arizona spring training complexes are in the "Phoenix metropolitan area," the Phoenix metropolitan area is bigger than nine states (about 14,600 square miles, larger than Maryland if you want a comparison). So if you want to go see the Padres or Mariners in Peoria and book a hotel in Scottsdale, congratulations, you're in the car at least 4 hours a day. And that drive is lousy, because I have done it. Pay attention to where you want to go the most. The Indians and Reds share a park in Goodyear, which is also way the hell out there. And you will be tearing your hair out if you have to drive from Scottsdale to Surprise on a regular basis to see the Royals and Rangers. At least the Goodyear ballpark is near the highway. The Surprise park, to the best of my recollection, is near nothing except the Surprise park. The real Surprise is that there's anything there. What's fortunate is that every ballclub trains in a good sized town (yes, even Surprise has 125,000-plus residents), which means decent hotels and house rentals nearby aren't hard to find. Though my Florida Spring Training knowledge is limited, I do know spring training locations are even more spread out there than they are in Phoenix, because they are spread throughout half the state. While I have annoyed native Floridians by saying Daytona is in "South Florida," my counter is always "As far as I'm concerned, every part of Florida is South Florida," although some parts are way more "souther" than others. In other words, don't book rooms in West Palm Beach if you need to go to Sarasota every day. If you're at all like me, you'll justify booking rooms "wherever" because you'll think "At least I'll be there, which is closer to spring training than where I am now. I can deal with driving." 2. Every park is different. Explore the others. Besides, as opposed to the regular season, nobody looks at you funny if you're decked out in White Sox gear at a Rockies-Royals game. You're there to see your team and you're exploring other parks while continuing to show team pride. Go ahead and be that guy, because everyone else is too. Though if you're wearing your gear at a rival's home park- Dodgers and Giants comes to mind- you're going to get heckled. It should be light, friendly heckling (anyone who goes over the top is just being a jerk), but it'll happen, and if you don't expect it to happen you're not thinking very clearly. 4. Nobody sells out every game. Except the Cubs. Cubs fans are insane. We already knew that, but this is more true in spring training. The only games that are guaranteed to sell out and be zoos from start to finish are Cubs games. Places that only rarely sell out (like Surprise, Goodyear and Peoria) are jammed when the Cubs play. Dodgers home games at Glendale are tough tickets, while their "away" games are generally not super-crazy-packed. Giants games in Scottsdale are pretty full and pretty pricey (blame the Bay Area tech market for that, too), but reasonably easy to come by when they're the visitor. Cubs games anywhere in Arizona are the exception. They are always, always, always, sold out. How do you watch a regular season game in your regular home park? You probably get in, find your seats, sit down and only move to go get food or use the bathroom. It is very important to remember while at spring training that these games don't count. So you don't need to be as vigilant about seeing every pitch that you might be at home. So get up and wander around the park. You'll find something cool in nearly every corner of the place. I am not necessarily talking about "a right field patio bar" (though there are those in most of the parks, my top picks being at Salt River Fields, Surprise and Scottsdale). Because the stadiums are small, sightlines are fantastic no matter where you are and you can walk all the way around (unlike some major league parks), so you can watch the game from different angles. Everybody there is from somewhere else, they are all on vacation and they all have their own different reasons why they came to the park that day. While wandering around parks I've found Australians seeing their first baseball game ever (they don't understand it) and I've found people who have had Chicago White Sox season tickets since the days of Nellie Fox. Get chatty. In truth, this is a fantastic guideline everywhere you go, but the ballpark is about the last place everybody doesn't have their nose in their phone all the time (just most of the time). You're on vacation and will never see these people again, so let 'er rip. Early in the spring training season even the regulars will do the morning warm-ups with the rookies and spring training invitees hoping to catch on. The later the season gets, the more the regulars get mornings off. Every day there's a game somebody is out there doing morning workouts that you can get close to at most facilities. If you don't mind who you see, go wander from pitchers to the batting cages to the practice fields. The closer it gets to Opening Day, the more likely you won't recognize anybody doing intense morning workouts. But then you have a better chance of getting an autograph (if you're into that kind of thing) or seeing "the future" of your team. 8. Make sure you get the right souvenirs! My top Spring Training souvenir, no question. We all own too much stuff and continue to get more. The key for any useful spring training souvenir is making sure it actually says "Spring Training" on it! Why get a regular Reds t-shirt when right next to it is the "Reds Spring Training, Goodyear Arizona" t-shirt? You're at spring training! I don't get too many t-shirts any more since I already have a billion. 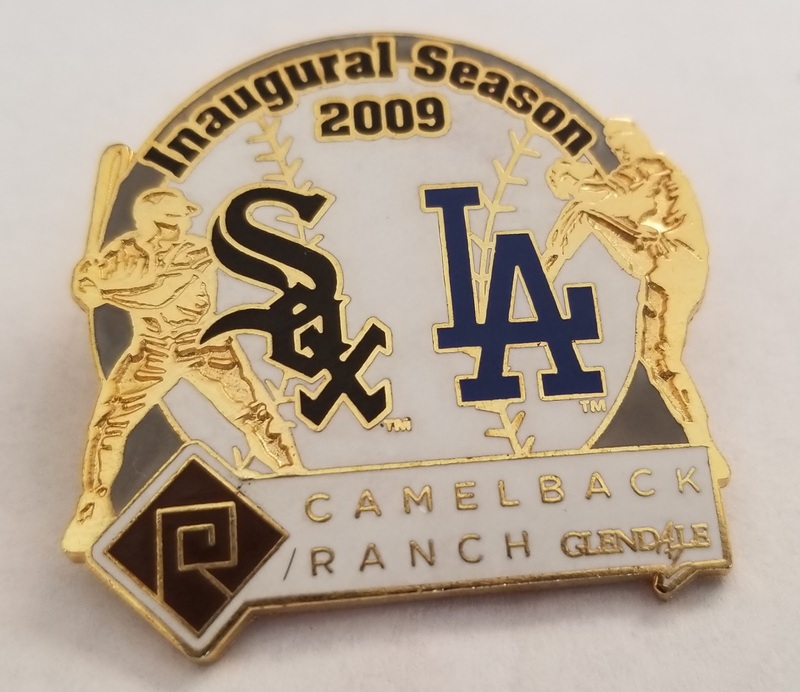 I now get pins or keychains or bottle openers and I always make sure it says "Spring Training" and the year. My travel apparel suggestion is always to get something slightly unusual. When I went to the Statue of Liberty I got a beanie, and when I wear the beanie I remember that vacation (so I should probably get rid of it. It wasn't the best trip). The point is that sweatshirts, hats and t-shirts are standard daily wear for most people. San Diego Padres Spring Training Sunglasses or Flip-Flops or Something Quirky Like That are different and will trigger a different memory bank in your mind. Besides, you'll feel clever-er for not just buying another damn t-shirt. And don't forget your ears. Just trust me on this one.